To know the end of vast settlements. The trails of our ancestors. And fish out memories sublime. I have always been all ears to the doomed ship, Titanic. The very thought that the huge mass of iron is submerged somewhere deep in the Atlantic Ocean rather fills me with a sense of thrill. I often hit the keys on my keyboard and bombard Google with thousands of questions regarding the “unsinkable ship”. This digging nature of mine has consequently helped me to find out what I am about to share with you today. How would you react if I tell you that not just ships, but entire cities are lying in the dark interiors of various oceans? Egypt is the Mecca of historical excavations. 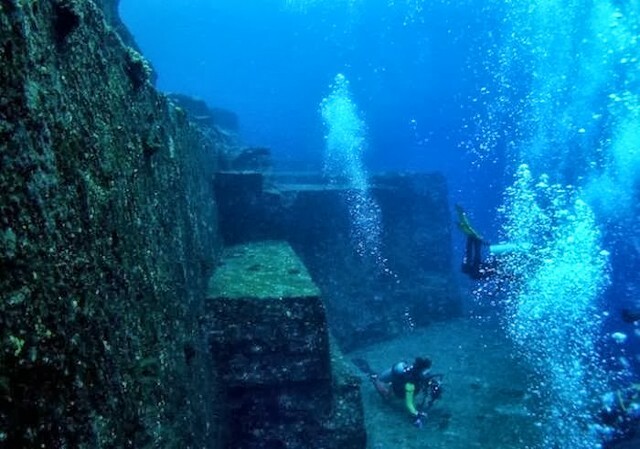 So it is not shocking to find underwater cities along its coast. Once located on the northern coast of Egypt, where the Nile delta meets the sea, these port cities were discovered after 1200 years underwater. 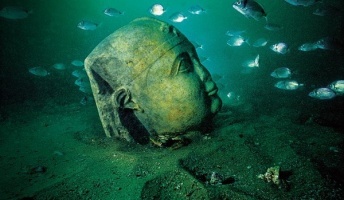 Called Herakleion by the ancient Greeks and Thonis by the ancient Egyptians, the ports were thriving trade centers. They were also important religious centers with their temples attracting thousands of pilgrims every year. 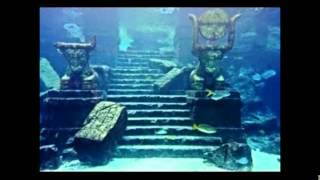 In 2000, the discovery revealed walls, temples, columns, and statues buried in the sand under 7 meters of soiled water. Also excavated were coins, amulets and jewelry from the 6th century BC. Especially relevant is a slab of black granite which was signed by the Pharaoh Nectanebo (380 – 362 BC). 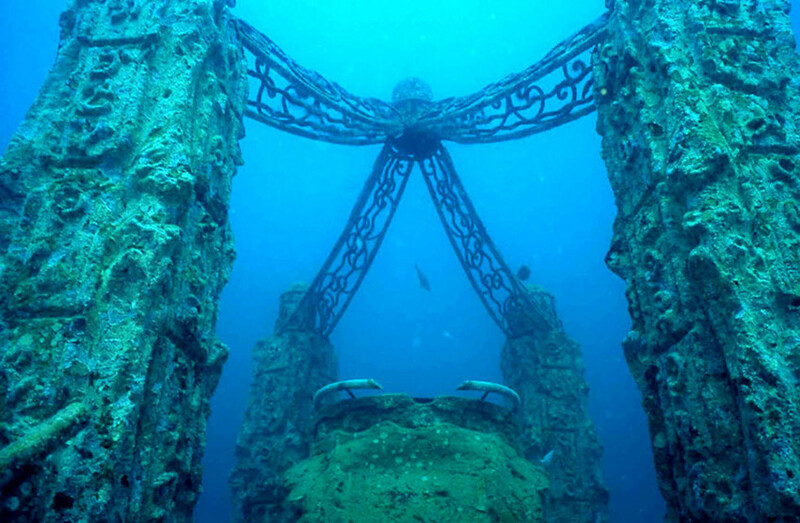 What is still unknown is exactly how the city ended up at the bottom of the sea. It is widely believed that the primary reason is an earthquake. 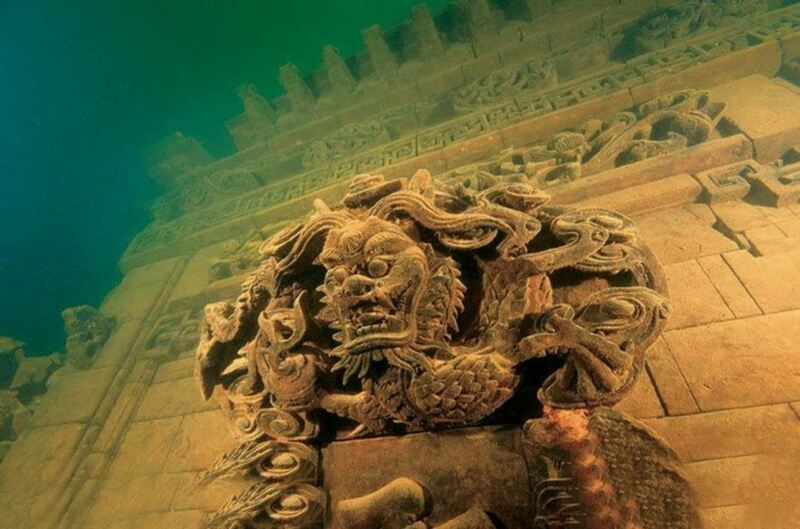 Built in Eastern Han Dynasty, today, Lion City can be found 85-131 feet beneath the surface of Thousand Island Lake. It is an area that was intentionally flooded to create a dam. In 1959, the Chinese government decided a new hydroelectric power station was required – so built a man-made lake. The city was slowly filled with water until it was completely submerged by the blue mass now referred to as Qiandao Lake. More than 3,00,000 residents were relocated which, for some, meant leaving their ancestral home. Its centuries-old stonework is still amazingly well-preserved. City walls dating to the 16th century still stand, and so do the city’s five entrance gates and countless statues. As a result, a maze of white temples, memorial arches, paved roads, and houses lie undisturbed even to this day. Furthermore, this man – made underwater city is the most popular Chinese tourist destination today. The site was first discovered in 1984 by the marine archaeologist Ehud Galili. Atlit-Yam is a submerged Neolithic (New Stone Age) village off the coast of Atlit, Israel that dates to 6,900-6,300 B.C. It has been so well preserved by the sandy seabed that human skeletons lie undisturbed in their graves, and a mysterious stone circle still stands as it was first erected, that may have been used for worship. There were no organized streets, so the site is described as a village rather than a city. Its people lived in spacious stone houses, with paved floors, courtyards, fireplaces, storage facilities and wells. Animal bones show that the inhabitants of Atlit-Yam hunted wild animals, but also kept sheep, goats, pigs, dogs, and cattle. It is believed that the village drowned after the nearby Mount Etna blew up, causing a major tidal wave along the coast. India is the land of myths and ancient tales. 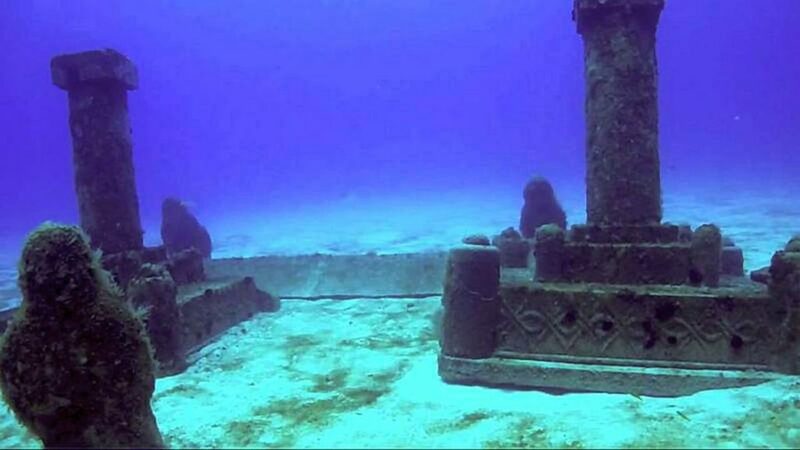 Mythology meets reality in this beautiful underwater city of Dwarka, off the west coast of Gujarat. The story goes that Lord Krishna had a magnificent city which was made up of 70,000 palaces made of gold, silver, and various other precious metals. The city was prosperous. 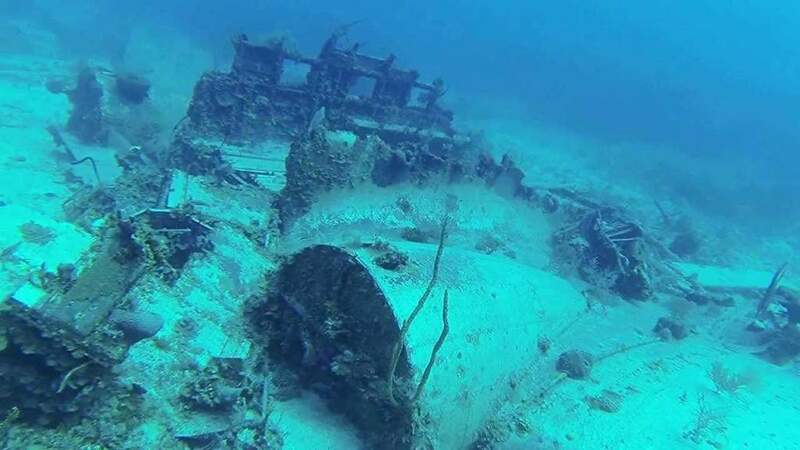 However, upon Lord Krishna’s death, Dwarka supposedly sank into the sea. The ruins are situated 131 feet beneath the ocean surface in the bay of modern-day Dwarka, one of the seven oldest cities in India. The city was connected by an elaborate system of roads, market places, assembly houses and temples. Marine archaeological explorations have thrown light on a number of structures, stone anchors, and other artifacts. Also found were sandstone walls, a grid of streets and remains of a seaport, some 70 feet beneath the sea. According to the Mahabharata, the city sank due to the curse of Gandhari on Lord Krishna. Although, the scientific reasons are still not known. We all have heard of Port Royal in the Johnny Depp’s movie Pirates of the Caribbean film series. 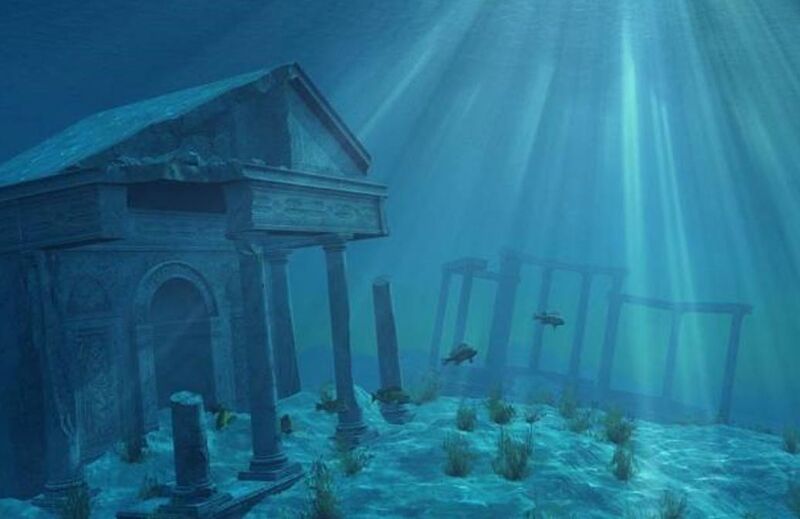 The story of this underwater city would compel you to wonder whether the admonitions mentioned in religious texts are actually true. The center of piracy, prostitution, booze and raging all – night parties, the 17th-century Caribbean town of Port Royal, Jamaica, was called “the most wicked and sinful city on Earth”, and then it was engulfed by the sea. Port Royal was one of the biggest English colonies with 10,000 people. Excavations revealed stacks of pewter plates, iron skillets and intact multi – storied brick houses and shops. In June 1692, a massive 7.5 magnitude earthquake shook the island of Jamaica and Port Royal sank into the ocean bed due to its unstable foundations. The city, largely built on sand, suffered instantly with structures, roads, and citizens being sucked into the ground. Geysers erupted from the earth, buildings collapsed and over 2000 inhabitants were killed. Divine justice?